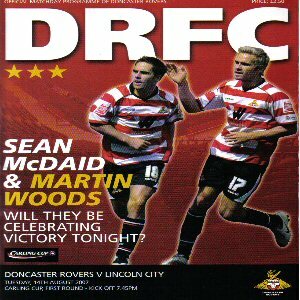 Having only ever been Doncaster Rovers' old ground once, I jumped at the chance to go to City's first ever visit to the new Keepmoat Stadium. Unlike most new grounds there is actually quite a fair bit to do around the area. For example, the Doncaster Dome is fairly close, as is a large shopping centre. It's a far old walk from those places to the ground though as it took me about 7/8 minutes to walk from the nearest other thing that most away fans would probably be interested in (a pub). As for the ground itself it is fairly well set out, with a huge club shop near to the reception. Once entering the turnstile it isn't a long walk before you're in the ground and to be honest, it feels like a mini-me version of Darlington's "name it every year" ground. Both of the side stands were identical to the other one, with the slight exception of a few areas for the disabled fans. 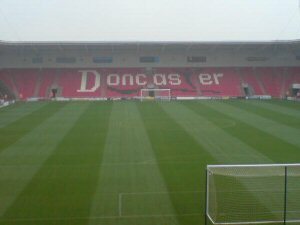 The two stands either end of the pitch also seems identical, with the word "Doncaster" written on them. All seats (with the exception of the seats forming the wording) were red. The view from the away end was decent despite a fair gap between the stand and the goal. The view of the other end was also decent despite the large pitch. 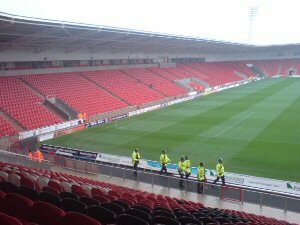 Unfortunately the atmosphere at the Keepmoat isn't the best, and even winning 4-0 at one point wasn't enough to bring out decent chanting from their fans. This might have been because it was only a cup game and the crowd seemed surprisingly low. 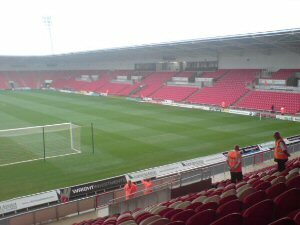 Overall the trip to the Keepmoat was a generally enjoyable one and I would recommend it to fans around the country.